Real invisibility cloak, quantum teleportation: How Harry Potter influences physics research. Did You Hear About the Real-Life Invisibility Cloak? How Harry Potter and Star Trek influence—and sometimes frustrate—physicists. 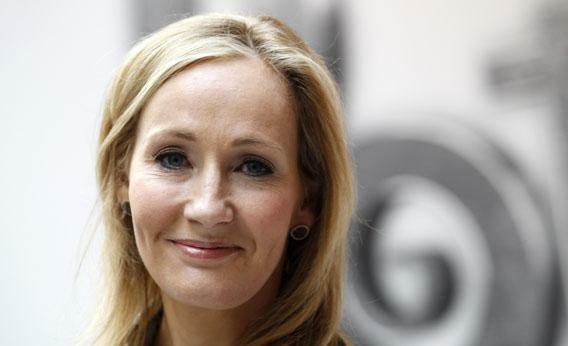 British writer J.K. Rowling, author of the Harry Potter series of books, invisibility cloak muse? Invisibility cloaks seem to be an enduring staple of science fiction and fantasy. When I was growing up, this was most evident in Star Trek. For the last decade or so, it’s been Harry Potter. The allure is not surprising—I expect that everyone has had a fantasy, at some time or another, about being invisible. Whether the motivation is to get a free peep show or escape out of, or into, dangerous situations, the freedom offered by disappearing into the background is compelling. The real question, of course, is: Will it ever be possible? Alas, no. In the first place, even if you could be invisible, it wouldn’t be all it is cracked up to be. It is a simple law of physics that interactions are two-way streets, so if you are invisible because nothing interacts with you, then alas, you wouldn’t be able to see—your retina would not intercept light. So there goes all the fun. But more important, perhaps, the particles that make us up do interact with electromagnetic radiation—which means that while we can camouflage objects, we cannot make them transparent to all forms of radiation. We might hide them in the microwave, or infrared, or even the visible part of the spectrum* by exploiting the wave nature of light, either causing the waves to bend around objects or by causing waves that scatter off the object to interfere with each other, effectively canceling each other out. But since this technological wizardry is usually tailored to the wavelength in question, then waves of vastly different wavelengths, like X-rays, for example, might still scatter off of them. Nevertheless, since I first wrote The Physics of Star Trek in 1995, the lure of invisibility cloaks has continued to motivate creative scientists, and several remarkable advances have taken place in finding new ways to literally make objects invisible, at least to certain frequencies of radiation. When announcing new research in this field, shrewd communications officials from universities and laboratories have, over the last several years, taken to referring to Harry Potter in their press releases announcing cloaks for buildings, shields for microscopic objects, and more. In recent weeks, the University of Texas–Austin generated lots of headlines with this press release. While none of these advances promises complete invisibility from all probes, progress in increasing the range of wavelengths, and the size of objects that can be shielded, is impressive. So even though true complete invisibility isn’t within our reach, the next question is: Is all of this work important enough on its own to merit the press coverage, or is the Harry Potter hook too enticing for journalists to ignore? For researchers to try to get their work noticed amid the barrage of scientific literature isn’t new, and tying their labors to popular culture franchises like Harry Potter and Star Trek can, after all, be particularly effective. When so-called “Quantum Teleportation” was first developed well over a decade ago, I remember getting a call in the middle of the night from a German newspaper eager to explore whether we would soon be “beaming” one another around as an alternative to air travel. I suspect that were it not for Star Trek, it might not have made news. The more interesting question is whether inspiration from fiction helps spur scientific research. Here the answer is not so clear. Science fiction, as Stephen Hawking said in the preface of my Star Trek book, inspires the human imagination. But the same can be said for all good fiction. Just because one finds parallels between fictional technologies and real ones doesn’t mean there is necessarily a causal relationship. Often creative people in different fields can come up with similar solutions to problems—just as the benefits of diagnosing human illnesses without cutting people open motivated the tricorder in Star Trek, and everything from ultrasound to MRI scanning in real life. Every now and then, much more rarely than some of my science fiction–writing colleagues like to think, sci-fi does inspire real-life researchers to pursue a field of study more vigorously than they might otherwise. I am told that the original “flip phone,” for example, was motivated by Star Trek, and the series also inspired a $10 million X-Prize competition to create a real tricorder. One hopes that the germ of inspiration that might come from fiction leads researchers to do better and more important work, and not to choose lines of activity that they may think will be popular because of its fictional currency. But I know many of the experimental physicists involved in teleportation, which is making great headway for important reasons, and I’ve examined the work on invisibility cloaks. It seems clear that their motivation is physics, not media hype. Whatever the interplay between fictional inspiration and creativity in science, there is little doubt that the real universe is generally far more fascinating than the imaginary universes of science fiction and fantasy. The job of scientists, and writers, too, is to keep pushing the boundaries. We can then be reasonably sure that nature will keep surprising us.